Tank Utility manufactures battery operated WiFi devices which monitor propane tank levels. Integrated into Control4 this ensures that your house responds to different levels of propane. This can be used to inform the home owner upon low levels or Control4 can be programmed to turn off unnecessary loads to preserve energy during a power outage. Shows to the closest level in 5% increments. Clicking on button will update the data immediately. 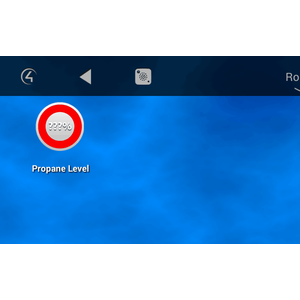 Monitoring and automating propane levels is extremely important for backup generators. The customer can be warned when the level is too low via notifications, emails or even an audio announcement. When this happens the dealer can programatically conserve energy by switching off unnecessary loads to ensure criticial systems remain operating throughout the power outage. How does the customer get informed of the current level? We developed an experience button which provides feedback in 5% increments. This gives the customer visual feedback on any Control4 navigator of the propane level at any time. NOTE - You will need good wifi signal at your tank. This driver communicates via the Tank Utility cloud service. As such if internet is disrupted data cannot be uploaded to by the Tank Utility device. or obtained by Control4.